Bike from 30th Street Station to Northern Liberties to catch a free concert from singer Brianna Lane. By Melissa Gadsden·	 7/30/2013, 10:29 a.m.
What’s the best way to get to Northern Liberties? Tonight, it’s by bike. 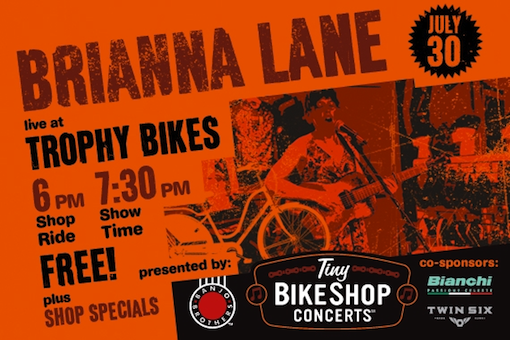 Trophy Bikes is hosting its annual Tiny Bikeshop Concert (cute name, right? ), and to accommodate all the Center City folks, they’re encouraging all cyclists to meet up at 30th Street Station at 6 p.m. for a leisurely group ride over to the show—so plan to burn a few calories before a night of music and beer. The show starts at 7:30 p.m. inside Trophy Bikes. You’ll hear music by Minneapolis-based singer/songwriter Brianna Lane; check her out here. FREE, July 30th, 6 p.m. bike ride (meet at Bridgewater’s Pub inside 30th Street Station) and 7:30 p.m. show, Trophy Bikes, 712 North Second Street, Philadelphia.